Our selection of smart recycling bins is the ideal choice when upscale recycling solutions are required! 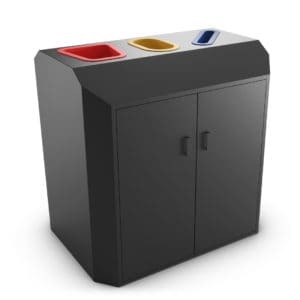 Endowed with useful technological features that ensure comfortable remote monitoring, our high-quality bins take recycling to a whole new level of efficiency and convenience. Leader n°1 in the world of smart recycling bins, Urbaniere offers you a wide choice of connected containers for businesses and local authorities. 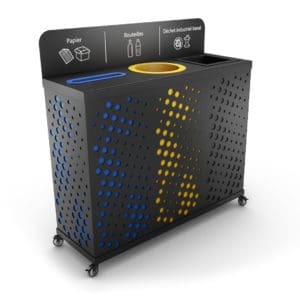 Highly committed to the search for innovation, environmental protection and recycling, Urbaniere designs and manufactures bins with built-in sensors to optimize waste management. 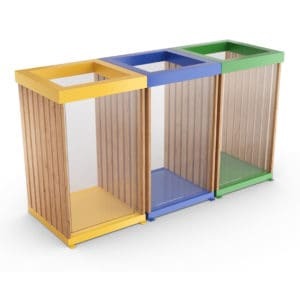 With several compartments, colors or symbols, for indoor or outdoor use, customized and so forth. 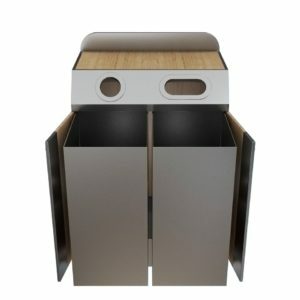 Discover here our unique choice of smart bins, and buy a connected container that suits YOU, for tailor-made use. 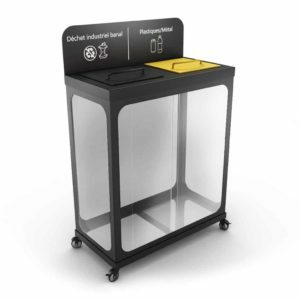 How does our intelligent recycling bins work? Thanks to this automatic system, you can then easily access, in real time, information on the waste thrown into the containers. Through a mobile application or in the dashboard available online, you can also view all this data remotely, all for maximum efficiency. These small electronic devices attached to the bins are durable and resistant to moisture, dust and the weather. 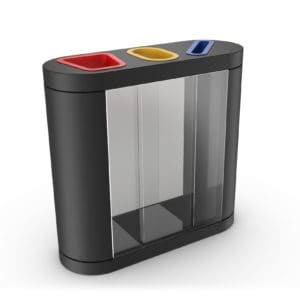 Why should you prefer a connected bin? 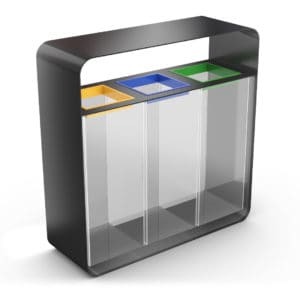 Optimize the work of the cleaning teams by developing a better collection schedule. 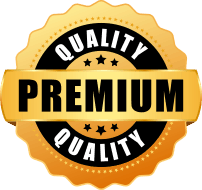 Your maintenance teams will be able to review their routes, their working methods, and travel only when necessary. – Reduce waste management costs by redistributing the tasks of the maintenance team in a more efficient way. Our VAXJO 4-compartment recycling bin is an excellent example of what we offer concerning smart, colorful recycling containers. 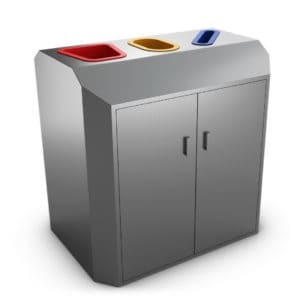 This bin is ideal for separate waste collection and is perfect for use in offices, schools, cafeterias and hotel lobbies. To promote understanding of the recycling process, smart recycling multi-bins with symbols are a practical and efficient alternative. By combining images and colors, you and your employees will be able to sort your waste without error. 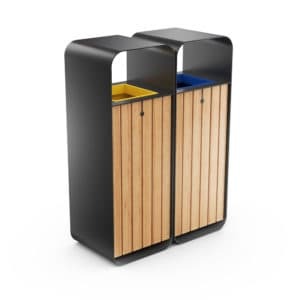 Discover for example our Andromeda model, an intelligent recycling bin with 3 bins and banners. 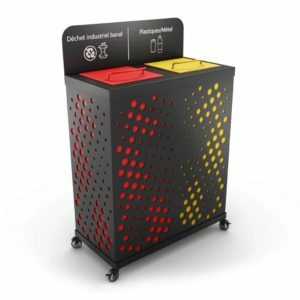 This unique solution combines color trays, symbols and signs (paper, plastic, and so on) for optimal disposal of waste. 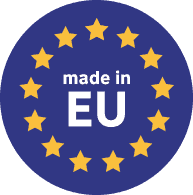 Since 1 January 2018, it has become compulsory for companies with more than 20 employees to sort at the source and collect separately. 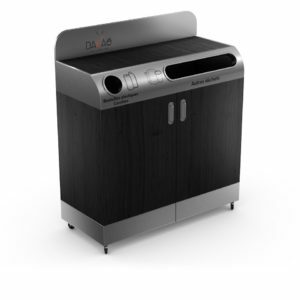 A good reason to learn about our different solutions adapted to this purpose. 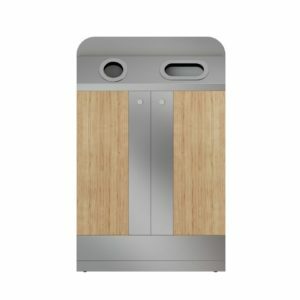 Would you like to install a connected recycling bin in an office? A meeting room? A canteen? Or a corridor? 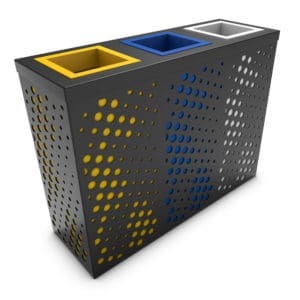 Our bins have different volumes and designs to meet your different needs. 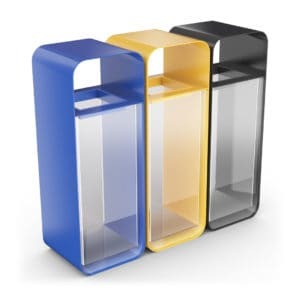 Modern and unique, they will also blend in perfectly with all types of settings, whatever your style. Our Auriga model is an excellent example of this. 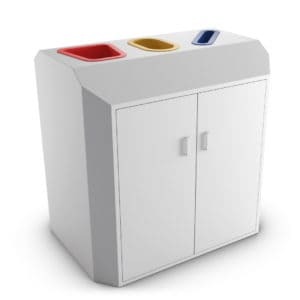 Equipped with 4 bins, including one for cups, this colorful and modern bin is perfect for use in the workplace and more particularly in break rooms or cafeterias. 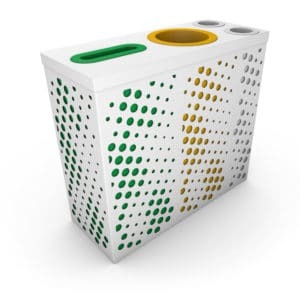 Do you want to install a smart recycling bin in a yard? A street? A park? Or another kind of open space? 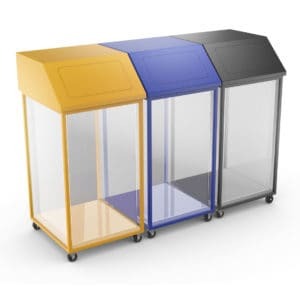 Our connected containers offer a tested and proven sturdiness. 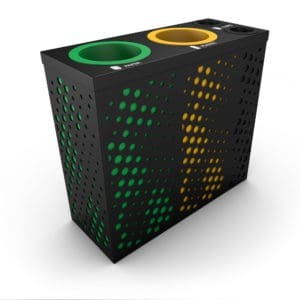 Durable and resistant, our smart outdoor recycling bins will withstand climate change, humidity, and the most extreme conditions. 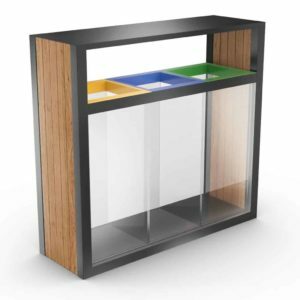 Able to withstand adverse weather and wind gusts, they can be fixed to the floor or a wall to ensure stability at all times. 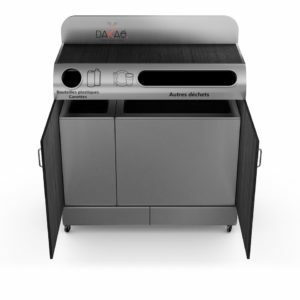 Made of stainless steel or steel, they are made of materials known for their solidity but also rustproof. 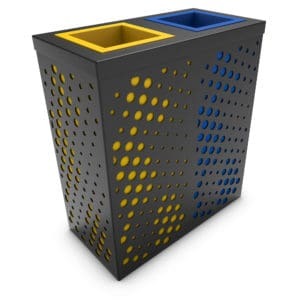 Other bins are also designed to be safe. Thanks to their design, which allows the contents to be visible, the various security forces (police, fire brigade, and so on) can act in a way that is more appropriate in emergencies. The KUOKIO model is an example of a multi-bins garbage can that complies with Vigipirate standards, one of the tools of the French anti-terrorism system. 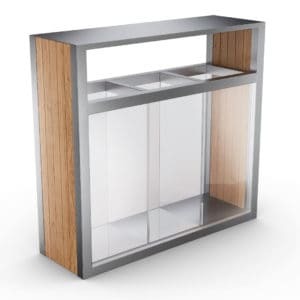 In steel, stainless steel, or wood. Stylish, colorful, natural, modern, unique, and so forth. 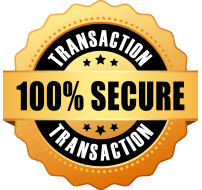 Small or large volume, and so on. Urbaniere customizes on request your smart recycling bins according to your needs but also your tastes and your budget. 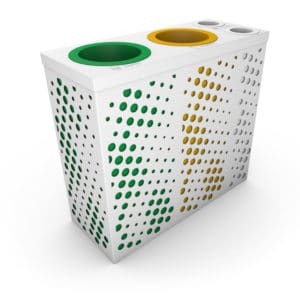 Feel free to contact us to learn more about our smart recycling bins.